SEACAMP III is an 8 day, 7 night program for high school students with previous SEACAMP II experience. As our most intensive program, students will participate in a 3-day live-aboard boat trip to the South Channel Islands. This gives students the opportunity to explore multiple snorkel and dive sites while expanding their in-water skills and observations. Again, qualified students will have the opportunity to add SCUBA diving to their session. Our SCUBA Program is only for Certified SCUBA Divers 14 years or older. In addition, the SEACAMP III program includes guest lectures that vary, depending upon the experts available to speak to the students about current research in their fields. Past lectures include “Deep Sea Fish Ecology” with Dr. Jeffrey Drazen, “Current Shark Research” with Dr. Chugey Sepulveda, and “Antarctic Research” by Scripps Institution of Oceanography’s Diving Safety Officer Christian McDonald. contact us to add your student to the wait list. Session is full. Please call 1-800-SEACAMP or email seacamp@seacamp.com to add your student to the wait list. Overnight camp open to students entering 9th through 12th grade in fall 2019. Student must have previous SEACAMP II experience. SEACAMP III offers both snorkeling and SCUBA diving. Student must be 14 years or older and be a certified open water diver by the start of session to participate in optional SCUBA Program. Session is full. Please call 1-800-SEACAMP or email seacamp@seacamp.com to add you student to the wait list. Enrollment is accepted on a first come, first served basis and must be done online. A partially refundable $300.00 deposit is required to secure student’s spot in session. SEACAMP III session is open to students entering 9th through 12th grades in the upcoming fall with previous SEACAMP II experience. Session is limited to 28 students. Students 9th grade or older have the option to attend SEACAMP II & III consecutively. Sessions indicated with (*) may be done with the next level. Students will stay with SEACAMP from the start of the first session to the end of the next session. Participants are able to switch between session dates providing space is available. Requests must be received by May 15th and will require new paperwork. Fees may apply for changes after May 15th. $1995.00 per student – $300.00 deposit required with enrollment. Tuition balance and required paperwork for session are due on or before May 15th. Click here to make Final Payment. Late fees start accruing at 3:01pm with $1.00 charge for every late minute. *Restrictions apply, please see Travel Information for more details. Housing, meals, admission to all attractions, gear, equipment, 24-hour supervision and transportation while in San Diego, plus SEACAMP swag. As an added benefit to those who are attending back-to-back sessions of SEACAMP I and SEACAMP II, your tuition will include all intersession activities, supervision, housing, dinner and breakfast. Transportation to San Diego is not included in tuition. Students and families are responsible arranging travel. SEACAMP does include transportation to and from the airport as long as flights arrive and depart inside the given window of time. Deposit and tuition may be partially refundable. Cancellations prior to January 31st are subject to a $100.00 cancellation fee. Cancellations between February 1st & March 31st are subject to a $200.00 cancellation fee. Cancellations between April 1st and May 15th are subject to a $300.00 cancellation fee. Deposits and tuition are non-refundable after May 15th. Cancellations must be submitted in writing and received by the dates stated above. Cancellation Policy applies to each session. Students will be housed in a traditional open style dorm equipped with bunk beds. We have two large dorm rooms, one for female students and one for male students. Students are assured 24-hour supervision by our SEACAMP Marine Science Instructors that spend the night in the dorms with the students. Students bring their own bottom sheets, sleeping bags and pillows. Dorms are separated by a courtyard area, which encloses a safe space to play games and hang out, and provides a sunlit outdoor area for the tables for meals or alternate lab space. Bathrooms are across the courtyard with separate facilities for males and females. Each bathroom is equipped with toilet facilities and separate curtained showers. SEACAMP San Diego provides all meals that are included on your schedule. Meals are supplied by our caterer while at camp and are prepared in their kitchen, or by the Horizon boat crew while on the boat. Breakfasts and dinners are usually cafeteria-style and served at our camp facility. Lunches are “brown-bag” style and usually eaten in the field. Meals are delicious and varied, well-balanced and include fresh fruits and vegetables. However, snacks are not included. If your student will need more than the meals provided, please have them bring individually wrapped snacks in a bag labeled with his or her name. Snacks will be stored and available daily to students. Students will also have the opportunity to participate in a three-day live-aboard boat trip to the South Channel Islands. During the trip students and staff will be housed on the Horizon Charters’ live-aboard dive boat, one of the largest dive boats in Southern California, which is comfortably equipped for many days at sea. See more information on Horizon’s vessel here. 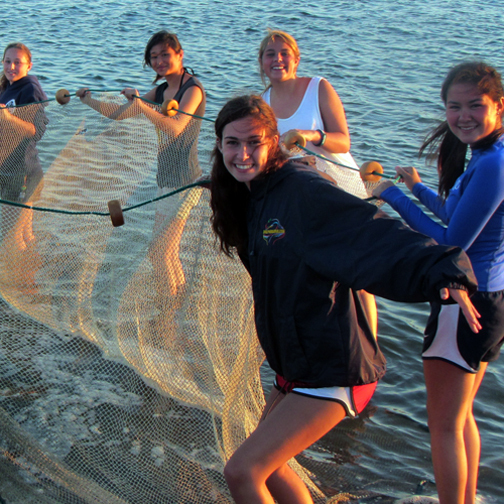 SEACAMP III has even more opportunities for in-water skills, field research and observation than SEACAMPs I & II. The highlight of SEACAMP III is the boat trip. Students and staff members will board the Horizon Charters’ live-aboard dive boat The Horizon for a three-day live-aboard experience. The Horizon is one of the largest dive boats in Southern California and is comfortably equipped for many days at sea. The boat cruises through the night and in the morning students awake to find themselves at one of the southernmost Channel Islands. 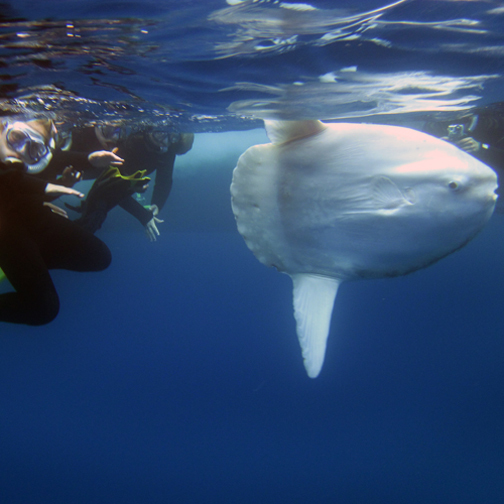 Conditions permitting, students may have the opportunity to dive, snorkel and kayak at Santa Barbara or San Nicholas Islands, in addition to Santa Catalina and San Clemente. Students who are 14 years or older and are certified have the opportunity to participate in the optional SCUBA program. While at sea, the group will participate in a collective research project focusing on local ecosystems. SEACAMP III also includes visits to some of the attractions that San Diego has to offer. Students visit the Stephen Birch Aquarium and spend a full day at the San Diego Zoo. Students will have the rare opportunity to tour the Scripps Institution of Oceanography research pier, which is not usually accessible to the general public. While visiting some of these world-class facilities, students will have the chance to participate in scavenger hunts and to work on their individual research projects using these terrific local resources. The SEACAMP San Diego SCUBA Program is optional and provided in addition to snorkeling. The program is only offered during our SEACAMP II & III sessions and is not required to participate in SEACAMP II and/or III. Qualified students will have the option to add SCUBA to their SEACAMP session, where they will join our SCUBA Instructors, Divemasters and co-SEACAMPers in the beautiful waters off of Southern California’s coast. SCUBA, or Self-Contained Underwater Breathing Apparatus, involves additional training and acceptance of additional risks. Students must be 14 years or older and a certified SCUBA diver by the start of their session to participate. SEACAMP San Diego does not provide SCUBA training; therefore, students with no formal training prior to the SEACAMP session will not be allowed to SCUBA dive. There are no exceptions to the SCUBA requirement – students must be 14 years or older and a certified SCUBA diver by the start of their session to participate in SCUBA. All SEACAMP II and III SCUBA students will participate in an initial shallow bay session to evaluate their skills and acclimate to equipment. Student divers are led by Divemasters or Dive Instructors in small dive groups of no more than 5 students. SCUBA Diving during SEACAMP II and III sessions is a choice and a privilege. SEACAMP reserves the right to remove students from the program at any time, especially if it is determined that they are jeopardizing the safety of themselves or others. If this is determined or if a student chooses not to dive, SCUBA fees will not be refunded. Students may use their own dive gear or gear can be rented at SEACAMP for a nominal charge of $100.00 per session. SEACAMP II and III students who register for SCUBA will receive more information and required forms with their registration packets. Travel to and from San Diego is to be arranged by the student and his or her parent/guardian and is not covered in the SEACAMP San Diego tuition. SEACAMP San Diego provides complimentary airport pick-up and drop-off, as long as students arrive and depart inside the designated window of time provided. See below for exceptions. Travel Information is due with the rest of the Registration Forms by May 15th. Any changes to travel after May 15th must be approved by SEACAMP San Diego but may not be possible. Arrival: Student check-in on the first day of camp is between 10:00am and 12:00pm. Students arriving by car must use the provided map to camp to navigate to the SEACAMP San Diego facility and be checked-in by adult. The map will be sent with the Student Information Packet emailed after enrollment. Please do not use our mailing address – it will not get you to our facility. SEACAMP provides a generous 2-hour check-in window, please ensure check-in is between 10:00am and 12:00pm. Late arriving students may not be able to join the group until dinner time. Departure: Student check-out on the last day of camp is between 1:00pm and 3:00pm. All students will need to be checked-out and signed out with SEACAMP staff. The authorized pick-up person will be required to show a government issued photo ID for student check-out and must use the provided map to camp to navigate to the SEACAMP San Diego facility. The map will be sent with the Student Information Packet emailed after enrollment. Please do not use our mailing address – it will not get you to our facility. SEACAMP provides a generous 2-hour check-out window, please ensure check-out is between 1:00pm and 3:00pm. Early check-out is not possible. If you happen to arrive early, please wait until we are ready for you at 1:00pm. Check-out after 3:00pm will result in late fee penalties. Late fees start accruing at 3:01pm with $1.00 charged for every late minute. Arrival: Flights must arrive on the first day of camp between 9:00am and 12:00pm into San Diego International Airport (SAN). SEACAMP staff members will meet students at the baggage claim carousal for their flight. Staff members will be wearing a SEACAMP San Diego t-shirt and holding a yellow “camper pick-up” sign. Please note, all students must be traveling as ticketed passengers – we can not have students flying as “standby” passengers. Travel Fee: Arriving Early – For flights that arrive prior to 9:00am, there will be no additional charge. Students will wait at baggage claim for SEACAMP Staff to pick up at 9:00am. Arriving Late – Flights arriving between 12:00pm and 1:00pm are subject to $25.00 fee. Student may need to go directly to beach to meet up with the group and may miss some of the scheduled activities. Unaccompanied Minor Fee: Students arriving as unaccompanied minors designated by the airline either due to age or due to preference are subject to a $75.00 fee. This service is only provided for students that are arriving inside provided window (9am -12pm). We are not able to accommodate students arriving early or late. SEACAMP must be notified of Unaccompanied Minor status on Travel Form. Upon arrival, SEACAMP staff member will acquire pass from airline to obtain entry into secured area of airport and will meet your student at the gate for his/her flight. If your airline of choice requires information regarding pick-up person, give the SEACAMP office a call/email and we will provide that for you (e.g. name, phone number, etc.). Departure: Flights should depart San Diego International Airport (SAN) on the last day of camp between 2:00pm and 5:00pm. Students will arrive at the airport 120 – 150 minutes before scheduled flights. SEACAMP staff members will assist students with the check-in process and see them through security checkpoints. Please note, all students must be traveling as ticketed passengers – we can not have students flying as “standby” passengers. Travel Fee: Departing Early – Flights departing between 10:00am and 2:00pm are subject to $25.00 fee. Student may miss some or all of the day’s scheduled activities. Departing Late – For flights departing after 5:00pm, there will be no additional charge. Students will go to the airport with the last group of students. Unaccompanied Minor Fee: Students departing as unaccompanied minors designated by the airline either due to age or due to preference are subject to a $75.00 fee. This service is only provided for students that are departing inside provided window (2pm -5pm). We are not able to accommodate students departing early or late. SEACAMP must be notified of Unaccompanied Minor status on Travel Form. Upon departure, SEACAMP staff will acquire pass from airline to obtain entry in to secured area and wait with student at his/her departure gate until plane departs. Service is NOT included in SEACAMP tuition. Provided for an additional $75.00 fee each way. Please check Amtrak Unaccompanied Minor Policy. Arrival: Trains must arrive on the first day of camp between 9:00am and 12:00pm into Old Town Transit Center (OLT). SEACAMP staff members will meet students on the train platform. Staff members will be wearing a SEACAMP San Diego t-shirt and holding a yellow “camper pick-up” sign. Departure: Service not provided for students 15 years old or younger. Only provided for students 16 years or older. Trains must depart on the last day of camp between 2:00pm and 5:00pm from the Old Town Transit Center (OLT). Students will arrive at the train station 30 – 60 minutes before scheduled departure. SEACAMP staff members will assist students with the check-in process and wait with them until train departs. While your student is here with us at SEACAMP San Diego, we are excited to give them an “unplugged” experience. Time away from the computer, TV, and cell phone means more time for learning, interacting, and being out in the field and on the water. This unique unplugged experience allows your student to truly engage with other students and all of the activities he or she will be participating in. For most families, it is the parents who find it hardest to cut ties with their student during a camp session. Students are engaged with new activities, new friends and busy schedules – no news is good news! Parents may feel reassured to know that we will, of course, contact them if their child is having insurmountable difficulties or issues while at camp that are brought to the staff’s attention. SEACAMP staff has access to SEACAMP cell phones at all times for inter-staff and emergency use. As you will not be receiving phone calls from your student once they have arrived at camp, try to remember that not hearing from them or SEACAMP is a positive thing – this means your child is okay and having a great time! Your student can, however, receive messages from home while they are at SEACAMP. Email is a great way to let your student know you are thinking of them and keep them up to date on life at home – please refrain from sending photos, as we do our best to keep waste minimal. Send your emails to camper@seacamp.com and include your student’s name in the subject line. Emails will be printed and delivered to camp once a day, except when students are on the live aboard boat trip. As there is no internet at camp, campers will not be able respond. Please be aware that messages are sometimes reviewed and those with inappropriate subject matter will not be delivered and may be forwarded to parent/guardian. Prior to you student’ session be sure to discuss the importance of communicating with SEACAMP San Diego staff members. Instructors can only remedy ills we know about or witness; some students are quiet about their needs or problems. We try to hire a diverse staff so that even reserved students will be able to find someone they identify with and trust. Reinforce the importance of telling instructors about any questions or concerns your student may have while at camp. All SEACAMP San Diego’s programs are centrally located in the community within easy reach of full medical facilities, including emergency care. All facilities are easily accessible by car and ambulance in case of emergency and professional medical care is on call 24 hours a day. Additionally, SEACAMP San Diego Instructors are certified Red Cross Lifeguards with First Aid, CPR for the Professional Rescuer and Oxygen Administration training. SEACAMP San Diego does not retain a nurse on staff, although we do have a paramedic consultant on call. Our registration forms ask parents/guardians to provide information about medical conditions, allergies, prescription and over the counter medications, etc. Our staff should be aware of medications that students should be taking. Student information is confidential and stays with SEACAMP staff at all times. With over-the-counter medications, completed registration forms provide us with a written list of what the child takes on a regular basis (Advil, Aspirin, Midol, etc.) and students bring their own supply. We have added a list of OTC medications that we stock at camp that may be available to your students if necessary, and parents may give permission to make these medications available if necessary. In regards to prescription medications, SEACAMP staff is not authorized to hold or administer prescription mediation to students. Students that require prescription medications will be responsible to hold and administer them. SEACAMP Staff cannot address or help remedy situations they are not made aware of. Students will need to communicate any health problems or concerns. If your child becomes ill or injured while attending SEACAMP San Diego, we will, of course, make sure that parents are kept informed about their child’s situation and progress. Whenever possible, parents/guardians will be included in decisions regarding their child’s care. SEACAMP San Diego Instructors remind students to keep their dorm space clean and clear, to shower regularly, wear clothing appropriate for the day’s activities and bring water bottles with them for the day. Two of the most important things for a successful camp experience is staying well-hydrated and sunburn free. Staff remind students to apply and reapply sunscreen and drink water throughout the day. Students have access to water and sunscreen all day – even when we are in the field for the day. It is helpful to discuss parent/guardian expectations regarding sun exposure, appropriate attire, hygiene and hydration, etc. prior to camp attendance. Ultimately, it is the student’s responsibly to stay well-hydrated and sunburn free. Registration Forms will be done online. Forms are due by May 15th. To access online forms, please sign in to My Account. Then navigate to Registration Information tab to complete required forms. You will need your order number for 2019 to access. Your order number can be found in My Account under the My Orders tab. The order was also emailed to you after completion. SEACAMP Information Packet – includes rules and regulations, map/address to SEACAMP facility, schedule, packing list and more. Required for each student and family to read and review. Registration Form A: SEACAMP session information along with student, parent, emergency contact information and student dietary and medical information. Registration Form B: Medical authorization – start date should the first day of camp and end date should be the last day camp session (students staying for multiple sessions – start date should be the first day of first camp session and the end date should be the last day of last camp session). Acknowledgement and assumption of risks and responsibility. Parent authorization. Boat Release Form: Release for Horizon Charters for live-aboard boat trip, required for each student. Form is included within the Registration Forms. SCUBA Form (optional): Optional for students participating in SCUBA Program that are 14 years or older and certified SCUBA divers. Form included within the Registration Forms. Forms must be submitted by May 15th to participate in SCUBA Program. Travel Information Form – Student should arrive on the first day of camp session either by auto to SEACAMP facility between 10am-12pm or by air to San Diego International Airport between 9am-12pm. Student should depart on the last day of camp session either by auto from SEACAMP facility between 1pm-3pm or by air from San Diego International Airport between 2pm-5pm. Train pick-up and drop-off service is provided at additional fee. Travel Form is due by May 15th and any changes to travel after May 15th must be approved by SEACAMP. All required forms are due by May 15th.